Last week, my newly graduated son and I (who both have medical issues) were in rest & recovery mode after the long weekend with two graduation ceremonies, family visiting, and a big party on Monday. My husband was out of town on business, so the two of us needed to find a new show we could watch on our own (there are several the three of us watch together). 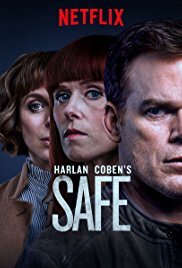 We discovered Safe, a Netflix original thriller series and loved it so much that I called my husband in Michigan and told him he needed to watch it, too. After watching six episodes in two days, my son and I laughed and agreed this was the very definition of binge-watching! Safe stars Michael C. Hall, of Dexter fame (another favorite show of ours), only with a British accent, which sounds really weird at first, but he pulls it off (I checked - he's originally from North Carolina). He plays Tom Delaney, the father of two daughters who recently lost his wife to cancer. The grieving family lives in a gated community in the UK, a place with extra security measures to make it "safe." When his 15-year old daughter, Jenny, played by Amy James-Kelly, doesn't come home one night, he's understandably worried, and as her disappearance continues over the next days, his concern turns to outright panic, as he tries to figure out where she went and what happened to her. The audience knows that Jenny went to a wild party the night before with her older (secret) boyfriend, Chris. When Chris shows up dead, Jenny's missing status takes on a whole new level of importance. Tom is aided in his search by Sophie (played by Amanda Abbington), a close friend - and maybe becoming something more - who is also a local police officer. In each episode, the mysteries pile up, with several more questions arising every time one is answered, and the audiences suspicions changing constantly. As you can tell by the way my son and I gobbled up this fast-paced mystery/thriller (we finished all eight episodes in just three days! ), it is gripping, suspenseful, and completely immersive. Its twists and turns kept us guessing right until the last episode (and my son almost always figures these kinds of things out early). We were completely addicted for those three days and couldn't wait to watch more each evening. My husband couldn't keep up with us, with his commitments on the business trip in the evenings, but he also finished the series after he got home. The TV series was created by Harlan Coben, the famous thriller author, though I don't see a book by the same name, so I think this may have been created directly for TV rather than adapted from a novel. In any case, its thriller-writer roots shine through. Safe is a Netflix original, so it is available exclusively on Netflix, with a single 8-episode season - you can easily finish it in a week! And you will want to. This looks great! Adding it to my Netflix list now. Sounds like a show i need to add to my must binge watch list!